How do I attach documents to opportunities? Sellsy allows you to attach documents to your opportunities so you can directly find invoices and estimates concerning the opportunity. Another advantage to attaching documents is that it gives you the ability to control the difference between the actual amount on the invoice and the initial estimation. To attach a document, click on Link sales document in the opportunity form. In the following window, please choose the document type and enter the document number. 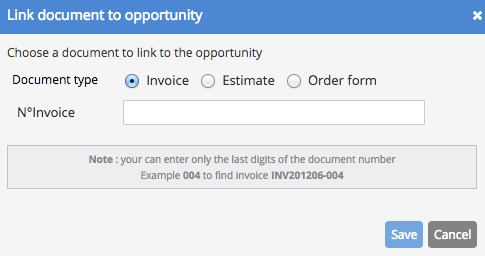 (Tip: you can enter the last digits, such as 010). The total amount given by document type will appear and can be compared to the initial potential. How do I use the pipeline view? How do I filter opportunities? How to delete opportunities in bulk?